Is Canada Heading for a Recession in 2013? To many it already feels like a recession! Anywhere you look it's bad news. Last March Canada lost 54,000 jobs, January's GDP had a dismal 0.2% increase, and now housing sales are crashing! In this post I will look at arguably the best leading indicator for the future of the economy - the housing starts! 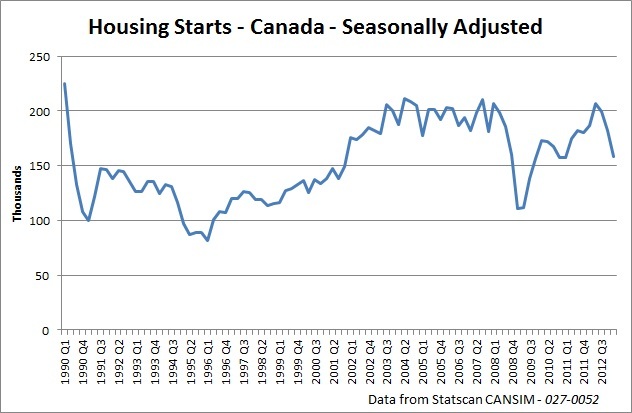 First we will look at Toronto's housing starts and then we will take a quick look at national stats. Housing starts is a leading indicator for both the real estate market and the overall health of economy. If the housing starts trend number is increasing, that means that the economy is on a growth path. If the number of housing starts is declining, that means tough times are ahead. Monthly housing starts stats are very volatile so you have to look at 4-6 months of data to see whether there is a trend emerging. 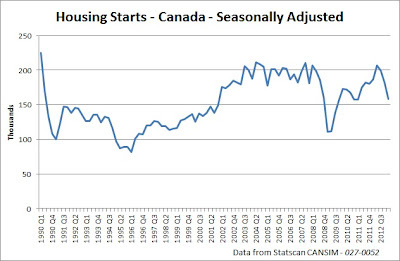 Below is a quarterly housing starts chart for the GTA. Please note the two last downward spikes, one in 2008 and the one today. In the last six months, housing starts in Toronto have crashed by -44%. This is pretty bad. Actually, it's very bad! Look, during the 2008 financial crisis, the worst two quarter drops in housing starts was just 1% higher then today, as starts declined by -45% between the 4th quarter of 2008 and the 2nd quarter of 2009. Back then the global economy was in a free fall. Then the government came to the rescue with record low interest rates and everyone jumped into the housing market like flies on dung. Sales, home prices and housing starts recovered to record levels at the cost of increased household debt. The housing correction that was due in 2008 never occurred as it was postponed to the present day! Given the awful housing starts numbers, combined with melting home sales, it looks like we are on course for a hard landing in Toronto. More on that in a later post. 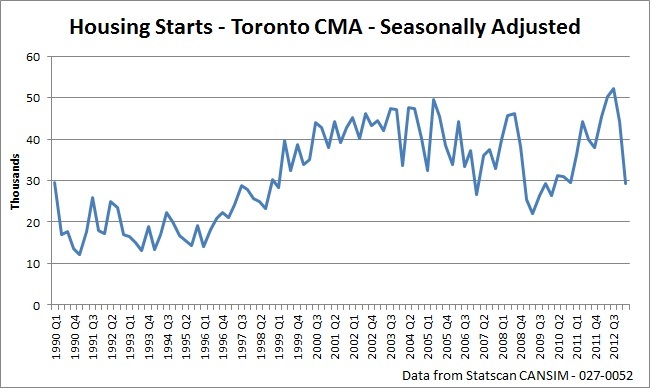 The question now is whether housing starts in Toronto will recover or decline in the next quarter. In my opinion, housing starts will decline further given the bloodbath that is occurring with new home sales. If somehow housing starts do manage to recover in the 2nd quarter, it would be a signal toward a possible soft landing. Though a bounce back of housing starts wouldn't guarantee it. As of late, I hear many anecdotal evidence of a dramatic slowdown in Toronto's economy. Firstly, my acquaintances in the construction industry (Home Depot) are telling me that there are barely any jobs available and they are stuck at home drinking beer. Secondly, my contact at a telecommunications company (Rogers) who installs land-lines and fiber optics to new businesses says his paycheck is presently a quarter of what it used to be. From talking to people on the street it definitively seems that there is a major slow down in Toronto. In my view, Toronto is heading for a recession and it may even already be in one! 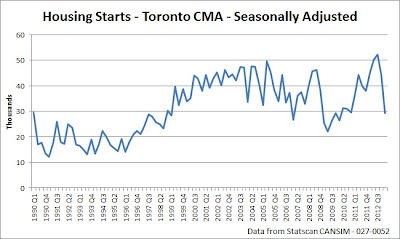 The good news is that so far the overall decline of housing starts in Canada is not as bad as it is in Toronto. The six month decline is -21%. If the next quarter result is negative, it is more likely that a recession will happen in the foreseeable future. 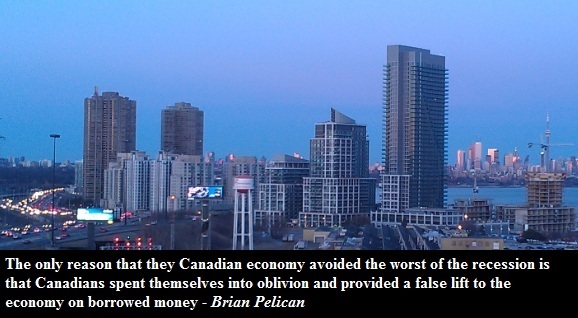 Will Canada enter a recession in 2013? I don't know that for certain but it seems very plausible to me given the dismal recent GDP numbers and job figures. There are still so many other indicators that foreshadow a recession that I will look at them in more detail in the later posts. So far I am waiting for data on building permits and residential investments for the first quarter of 2013.